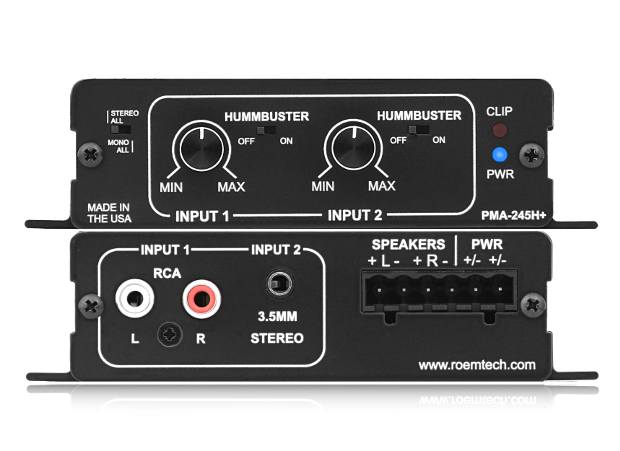 The PMA-245H+ incorporates Roemtech's proprietary HummBuster technology on both inputs. This allowes the installer or end user to simply "switch off" annoying hums or buzzes without affecting audio quality. The switches on the front panel are easily accessed and will effectively filter out hums and ground-loop issues that have traditionally plagued audio systems. Getting rid of audio noise has never been easier. With a true 45 watts of power, the PMA-245H+ will give you the audio clarity you need for your largest classrooms. In many environments, ambient background noise such as HVAC systems and hallway traffic is an issue. With the PMA-245H+, these issues won't overpower your sound system. The PMA-245H+ has been designed with full-range performance in mind. Most amplifiers in this category do not put a lot of emphasis on accurate frequency performance. Roemtech has a different view, delivering crystal clear audio while maintaining impressive bass response. The PMA-245H+, handles the entire audio spectrum with superb accuracy. Featuring the latest innovations in class A/B technology, you will experience stunning performance while staying on budget.